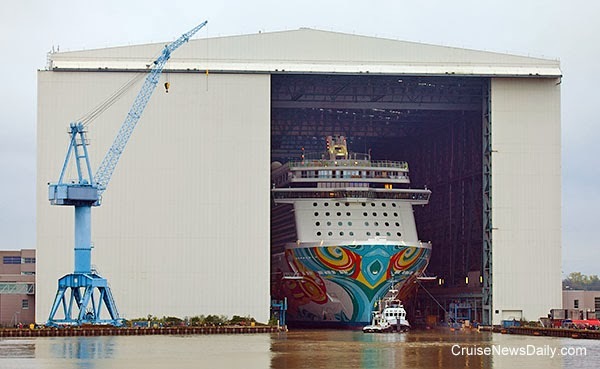 Meyer Werft floated out Norwegian Getaway at their Papenberg yard this afternoon. Because the operation started at mid-afternoon, the float out continued past dusk. The maneuvering in the lagoon and testing continued into the evening. 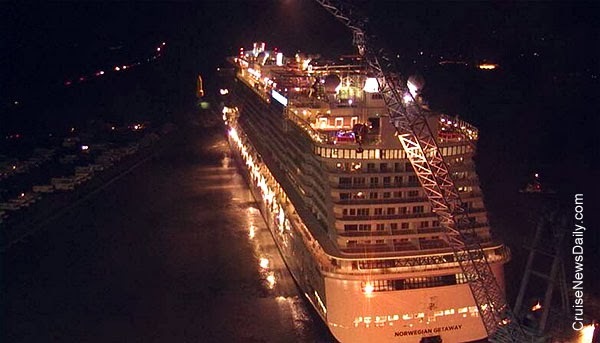 The entire operation was put together in this video by Meyer Werft on Monday. Courtesy of Meyer Werft. Copyright Meyer Werft and Cruise News Daily. May not be copied or used without permission. Turn on the air and lights. Finish the dusting. The Bayport Cruise Terminal at Houston is finally ready board its first ship that will be sailing from the facility on a regular basis. Caribbean Princess will sail from Bayport on Tuesday with a special 4-night cruise. CND subscribers also read about a time change (more) ... and putting two and two together. The complete articles appeared in the e-mail edition of Cruise News Daily delivered to our subscribers. 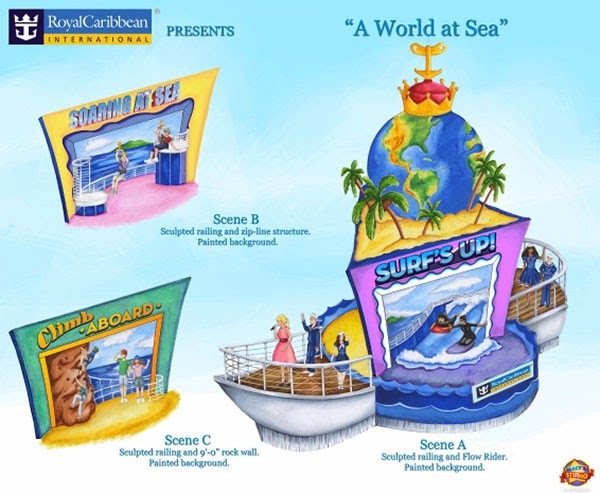 With Quantum of the Seas homeporting at New York next year, Royal Caribbean will again part of a New York tradition this month when the line again has a float in Macy's Thanksgiving Day Parade. This will give you a first look at the float's concept. The parade will be broadcast in the US on NBC from 9am to noon in all time zones on November 28, 2013. What better way to show people something about what a cruise is like than to bring part of the ship to them? CND subscribers also read about high hopes in Mobile ... an update from Australia ... and facing reality in Bermuda. 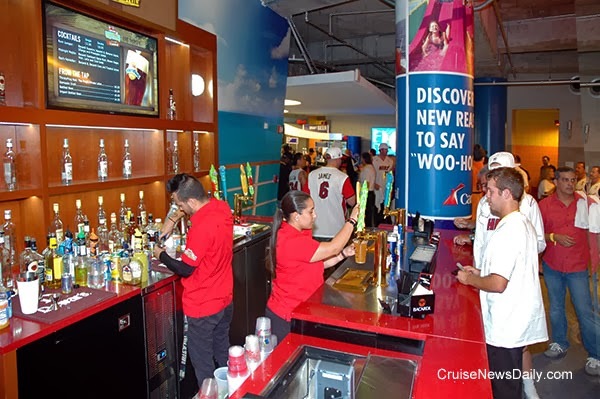 Carnival Cruise Lines has brought three bars from the ships to the American Airlines Arena in downtown Miami, where the cruise line has partnered with the Miami Heat basketball team at their home court. 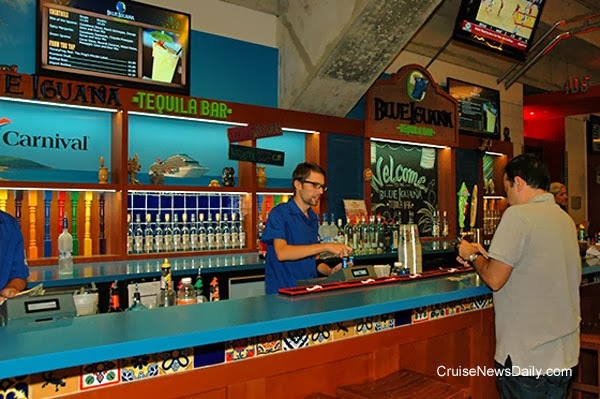 The bars are inspired by two of the Fun Ships' signature bars, the ThirstyFrog Bar and the BlueIguana Tequila Bar. 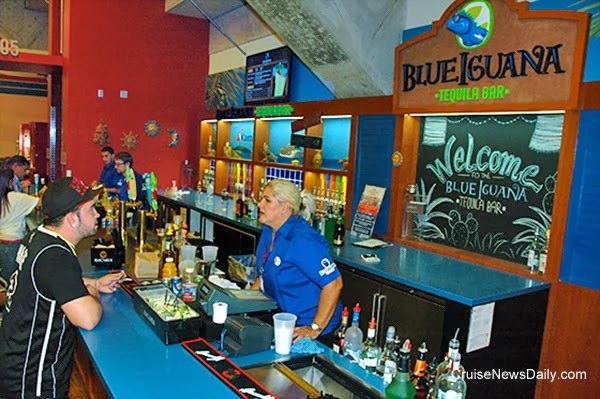 There are two ThirstyFrogs (on the 100 and 400 levels), featuring signature rum drinks, and the BlueIguana is on the 400 level featuring specialty tequila drinks. 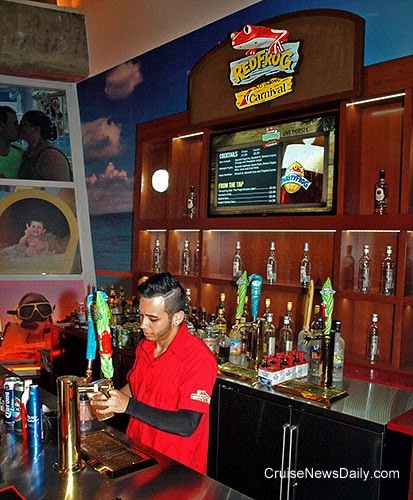 All three bars also feature Carnival's private label ThirstyFrog Red draft beer. Of course the idea is that if you enjoy the sample, you'll enjoy the ships. Photos courtesy of Carnival Cruise Lines. Copyright Carnival and CND. All rights reserved. * Is Someone Watching You? On Disney Cruise Line at the family pool, the answer is - or soon will be - yes. The line is adding lifeguards at the family pools on all ships during the pools’ posted opening hours. Luggage handlers at Port Everglades are completing a customer service training program just in time for the 2013/2014 cruise season, The goal is that passengers will see an extra level of personal service and caring that will make them choose the Broward County port again. Norwegian Cruise Line today became the Official Cruise Line of the New York Knicks. 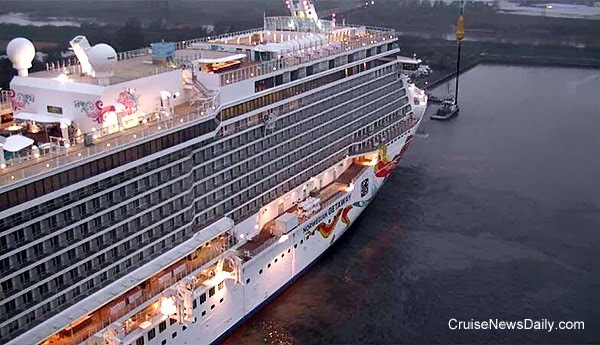 As a result you’ll see the cruise line featured during New York home games. In last week’s earnings call, where Royal Caribbean executives discussed their third quarter earnings, a theme that ran throughout (reinterpreted for the consumer perspective) was why in the end, you’re probably going to pay more for your next cruise, or at least they’re going to make more money off of it. So prepare yourself. The complete article appeared in the e-mail edition of Cruise News Daily delivered to our subscribers. 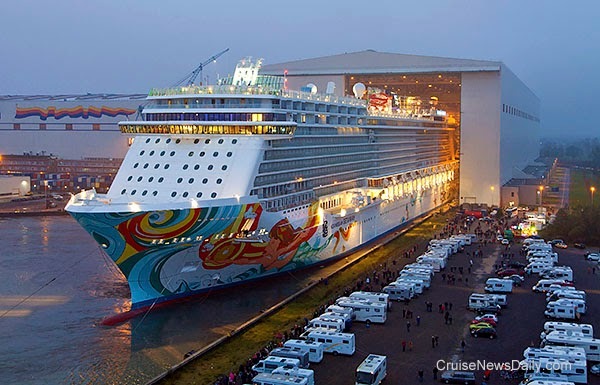 Last week CND reported to subscribers that Meyer Werft would float out Norwegian Getaway from their covered building dock on Saturday (November 2, 2013 at approximately 3:30pm local time - 10:30am eastern time in the US). The date and time, of course, are always tentative subject to the weather cooperating. The event will be webcast on the Meyer Werft website on Saturday. 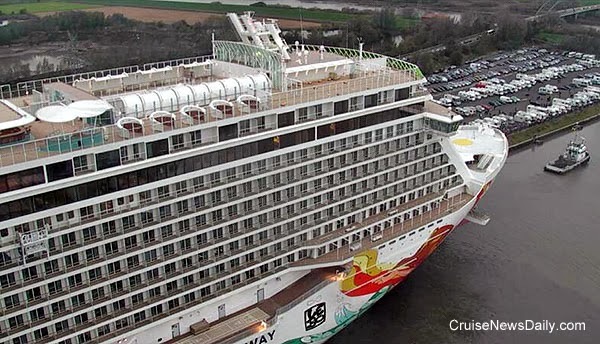 Meyer will schedule Norwegian Getaway's transit of the Ems River to the North Sea at a later date. It is tentatively planned for mid-November. 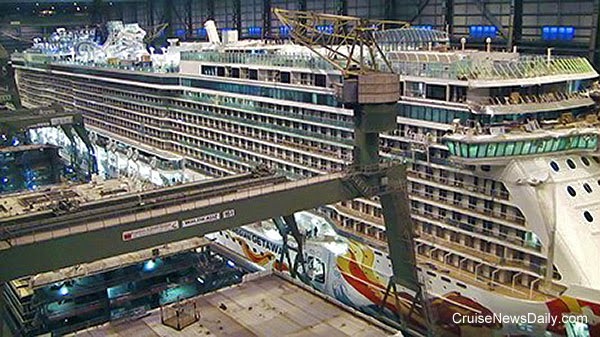 In this photo taken yesterday, Norwegian Getaway is shown nearly complete and being readied for its float out. You'll note the funnel is still to be attached after the float out. Once in the lagoon after the float out, tests will be carried out for several hours before docking at the finishing dock. Then within a couple of days the Norwegian crew will arrive and move aboard the ship. 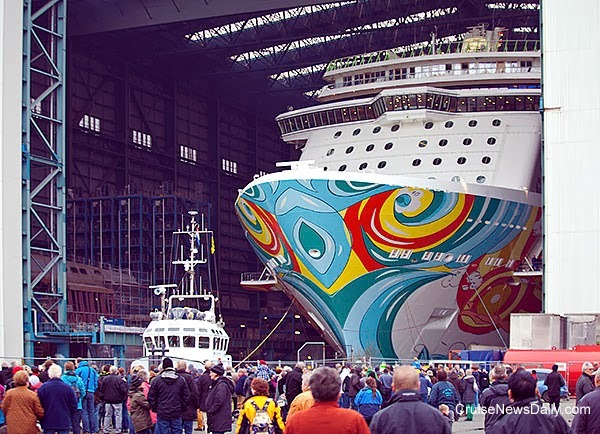 Photo courtesy of Meyer Werft. All rights reserved. * Do you Like to Eat? Quite a few years ago, when I was a travel agent, I remember suggesting a cruise to a client. She rejected it out of hand, saying, “I don’t want to go on anything like that. Everybody just sits around and eats.” I tried to assure her there was much more to the cruise than dining, and despite what she had heard, normal quantities of food were consumed by most people, but secretly I liked her perception better than reality. Now thanks to Celebrity, I think my fantasy (and the woman’s nightmare) has been fulfilled. Next summer, on their President’s Cruise, Celebrity will create a week’s worth of special memorable experiences in dining and entertainment, created specifically for this sailing, special enough that it would even tempt my former client. CND subscribers also read about Royal Princess' maiden arrival in Ft. Lauderdale (more) ,,, and what slump in Alaska? The newest ship in Princess Cruises' fleet - Royal Princess - arrived in the US for the first time this afternoon. Gavin MacLeod was on hand to greet the new ship at Port Everglades in Ft. Lauderdale today. 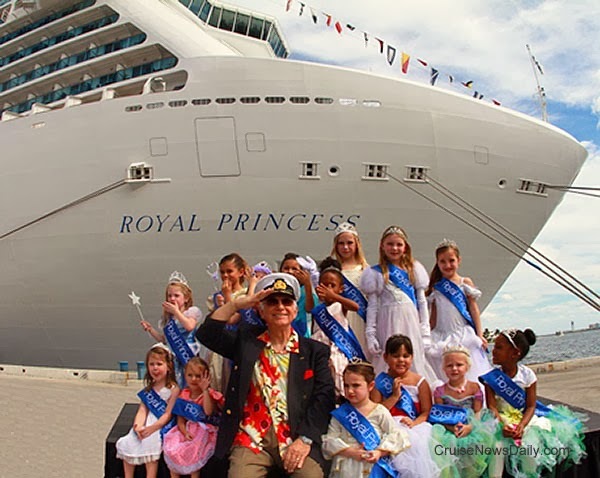 He is Princess Cruises' ambassador and is best known for his long-running part as Captain Stubing in classic TV series, "The Love Boat." Royal Princess has been sailing in the Mediterranean since June when it was officially named by Her Royal Highness The Duchess of Cambridge. After a two night preview cruise from Ft. Lauderdale for invited guests, Royal Princess will enter regular service from the US with a five-night cruise on October 29. Throughout the winter season Royal Princess will sail a series of seven-day cruises from Ft. Lauderdale to the eastern Caribbean.